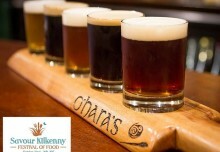 This October Bank Holiday weekend marks the annual Savour Kilkenny Festival and to celebrate O’Hara’s Irish Craft Beers are taking part in a number of events throughout the weekend. Here are some of the events we are looking forward to. All Weekend: Craft Beer and Cider tent in association with Brewery Corner: We will be pouring a selection of our beers including festival favourites like O’Hara’s Dunkelweizen & Hop Heavy IPA. Also we will be introducing this year’s batch of our seasonal amber ale – O’Hara’s Winter Star. 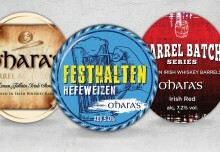 If that wasn’t enough we also have, exclusively for the festival, the launch of the 4th Edition in our Barrel Aged Series – O’Hara’s Barrel Aged Leann Folláin. 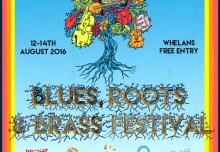 This year the tent will host a number of Irish craft brewers including; Dungarvan Brewing, Metalman, White Gypsy, Trouble Brewing, Costello’s, as well as Stonewell Cider. On Saturday at our craft beer pub, Brewery Corner we have a Foraged Food and Craft Beer pairing. 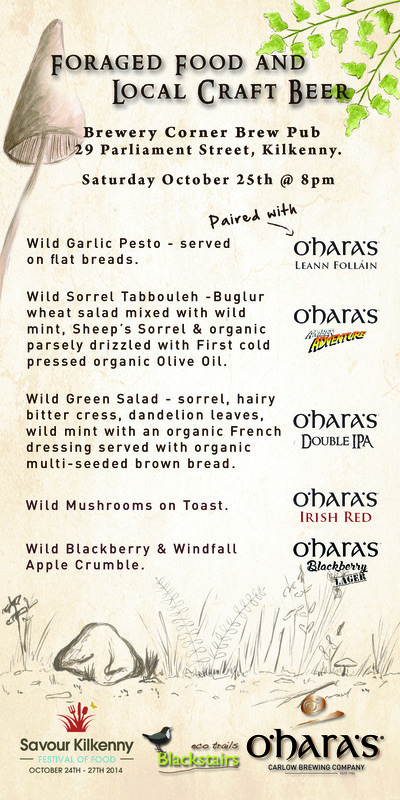 We’ve teamed up with Blackstairs Eco Trails and Heritage Expert, Mary White to bring you a menu of delectable treats from pesto to wild mushrooms, salads to apple crumbles, all splendidly paired with an O’Hara’s Craft Beer (see menu). 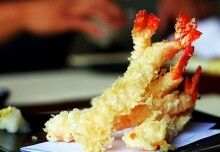 So why not come down to savour all this and much more, this weekend.